Now back to that hem. I tried cutting them both to the tunic length but in truth it was too short for what I wanted before I had even turned it under. In the end I had to kind of make a bit of a feature of it and have a different hem. I had some left over from clever cutting out therefore I added a band to give it the length I wanted. As part of my 2018 craft resolutions - I used the buttonhole foot to make 9 button holes. It is so easy and on my machine, it is all automatic. 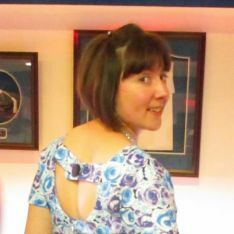 Overall it is the dress I want for airplane travel for our holiday to France in May.